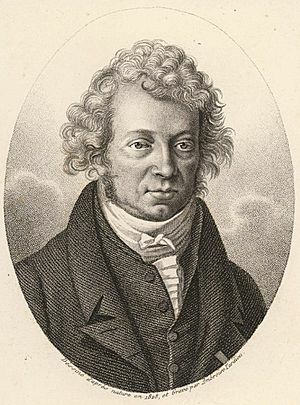 André-Marie Ampère (20 January 1775 – 10 June 1836) was a French physicist and mathematician who helped discover electromagnetism. An electrical unit called the ampere is named after him. Ampere was born in Lyon, France in 1775. During his childhood, Ampere's father taught him Latin, until he found out that his son was talented in mathematical studies. However, young Ampere continued his study on Latin, so that he could understand and master the works of Euler and Bernoulli. In his later life, Ampere began to distinguish himself in mathematics, but also he studied history, travels, poetry, philosophy, and the natural sciences. During the French Revolution, a great sorrow came to Ampere's life; he lost his father who was executed by revolutionaries. The death of his father brought a huge impact to Ampere. In 1796, he met the daughter of a blacksmith living near Lyon named Julie Carron, and married her in 1799. Afterward, Ampere worked as a professor in Lyon, giving lessons in mathematics, chemistry, languages, and physics. He continued working as a professor even after the death of his wife in 1803. However, her death bothered Ampere for the rest of his life. Ampere died at Marseille and buried in the Cimetiere de Montmartre, Paris. In his work Journal et correspondence, we can see his amiability and childlike simplicity of character. Ampere is most known for establishing the relationship between electricity and magnetism, and combining them into a new field called electromagnetism, or electrodynamics. On September 11, 1820, Ampere heard from the discovery of H.C.Orsted that a magnetic needle can be activated by a voltaic current. Only a week later, he came up with a much more advanced version of that kindred phenomena. It was such an amazing development. On the same day, he also discovered like charges repel and different charges come towards each other. André-Marie Ampère Facts for Kids. Kiddle Encyclopedia.